Like a lot of people, I read the Anne of Green Gables books as a kid (although I think I stopped somewhere around Anne of the Island, so maybe I ought to go back and finish). Anne Shirley was the heroine to many an adolescent girl- a dreamer who reached for the skies while hating her hair and her looks, a fiery redhead who wanted to fulfill her dreams, an orphan whose makeshift family proves more loving than anyone else’s. Of course, the story is so well known that it’s had countless film and television adaptations, the most famous being the 1980’s CBC miniseries. But now it’s back again in the form of a new Canadian series, called Anne (or Anne With an E for Netflix’s international distribution, but I refuse to call it that), which is loosely based on the original books. By “loosely,” we’re talking character names, occasional events from the book (not necessarily in order) and a lot of made up incidents. This may prove aggravating to purists (and there are a lot of those when we’re dealing with a property this beloved), but I find it refreshing to not necessarily know everything that’s going to happen. Think of this one as more along the lines of the 1970’s Little House on the Prairie show- inspired by but not necessarily based strictly on the Laura Ingalls Wilder novels. The show was created by Moira Walley-Beckett (a veteran writer/producer from Breaking Bad of all things) and the first season skewed a little closer to some of the events in the early part of the first book, but Walley-Beckett is most interested in updating the story to fit to modern times. This Anne is more or less a feminist in the making, and the issues Walley-Beckett wants the show to deal with are more serious subjects that could affect women at any time. I don’t mind this radical interpretation of it- I always wonder myself how to update period pieces to deal with contemporary material (one of the shows that did this best was Steven Soderbergh’s very underrated The Knick). The success of shows like Stranger Things has re-opened the door for more films and series to take young people seriously, and this is a rare show that centers a child (Anne is thirteen in the first season) and her classmates, while also giving adequate screentime to Marilla (played very well by Geraldine James) and her brother Matthew (R.H. Thomson, given a lot more screentime than the character has ever seen before). In this version, there are traumatic flashbacks to Anne’s time at the abusive, Dickensian orphanage and the appropriate amount of horror paid to the experience of her first period (another subject rarely tackled in period pieces, though surely many women have wondered how they managed back then- just towels??? Horror indeed). 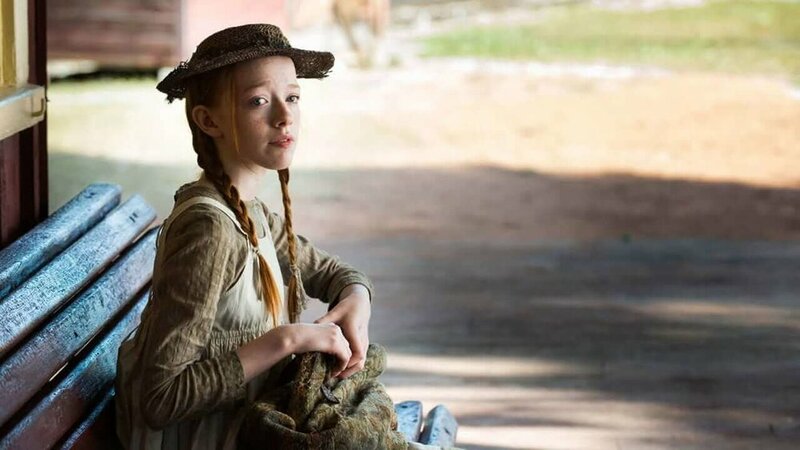 By veering closer to the book, the seven episode first season is more successful overall than the second (this is my favorite version of the Gilbert “carrots” tease- and Gilbert himself is perfectly cast with the very appealing Lucas Jade Zumann), but let’s talk about what makes Anne worth watching, and that’s Amybeth McNulty, giving one of the very best child performances I’ve ever seen on television. I don’t say that lightly, but even as I do, I warn you that me saying that does not guarantee that you’ll like her character, and that is exactly what makes it so brave. McNulty is a unique screen presence from the beginning, the very first version of Anne that actually warrants the label of awkward or even homely, and as a character her outspokenness often comes across as rude, arrogant, or ignorant while also throwing herself into this imaginative, at times selfish girl with true abandon. There are episodes that you want to throttle her, others where she embodies the inspiration and spirit of a true rebel ahead of her time. It’s a bold performance because whatever she is, she’s never unconvincing as the true eccentric who comes to Avonlea to shake things up. I have no doubt that she will be a polarizing character and your response to her may dictate whether you can stick with this show or not. But I admire her gusto wholeheartedly and I think she often delivers Anne’s flowery, over the top diatribes in a way that no other actress her age probably could. The ten episode second season hit a couple of speed bumps, one involving a (thankfully) three episode storyline about two con artists who scam the townspeople out of their savings with a literal gold-digging scheme, and Gilbert’s sojourn traveling the world is kind of farfetched and keeps him and Anne away from each other for far too long. But it does more or less successfully introduce some diversity into the very white world of turn of the century Avonlea with the likable original character of Bash (Dalmar Abuzeid), who travels back to Canada with Gilbert to help him tend his farm. Most of the season has nothing whatsoever to do with anything from the books though, so if you were waiting for that, you’re out of luck. More contemporary issues are introduced, with Miss Stacy as a motorbike riding, pants wearing, first wave feminist, and Diana’s Aunt Josephine in this version is a bohemian lesbian whose longtime partner has passed away. New classmate Cole is also gay, and these are revelations which Anne miraculously accepts as perfectly fine with her, the consummate outsider. Is it anachronistic? Perhaps, but it gives the show a special kind of tone that’s all its own- a tone that can be a bit strange at times as it volleys back and forth among these present day concerns. Not every character is likable either (Cole himself didn’t do much for me, sorry), but I enjoy the show enough to stay with it- in some ways it’s a bit like Downton Abbey meets Stranger Things, and you have to admit that’s an odd combination. But the Netflix budget provides for a lovely production that’s elaborate in it’s early 1900’s detail, and the supporting cast works wonders with what they’re given. It’s an interesting experiment with some heavily used material, one that could use a refresher. September 27, 2018 by Ariel Shavonne.